Preheat oven to 350 degrees F - about 15 minutes before hand. Beat egg. Add sugar then melted butter and 1 cup milk or wine. Pour into dry ingredients and beat until smooth. Pour into lined and greased loaf tin and bake for about an hour. When the bun is done baking, make the glaze by blending the sugar and water. Spread it on he bun and return to the oven for a further 5 minutes. Melt margarine and mix with stout, sugar, spices, salt, honey and molasses. mix well. Sift flour and baking powder, and fold into the liquid. mix well to prevent lumps. Add mashed sweet potato, mix thoroughly. Add fruits. Pour into greased loaf tin, bake at 350 degrees F or 1 1/2 hours. When baked, make a glaze with honey and water and brush the top. Boil stout, sugar, molasses. Add spices and butter. Set aside to cool. When cool, add flour, fruits and beaten eggs. Bake in loaf pan at 325 degrees F for an hour or until brown and a knife inserted in the centre comes out clean. If necessary, reduce heat to 300 degree F after an hour. Soak raisins in water and set aside. In a small sauce pot, melt margarine and allow to cool. Mix together in a medium mixing bowl all dry ingredients. In a large mixing bowl, beat eggs until foamy, add vanilla, and water. Stir in the sugar and mix until all the granules are dissolved. Gradually add liquids to dry ingredients. Mix until smooth. Fold in chopped mixed fruits, raisins, grated coconut and grated ginger. 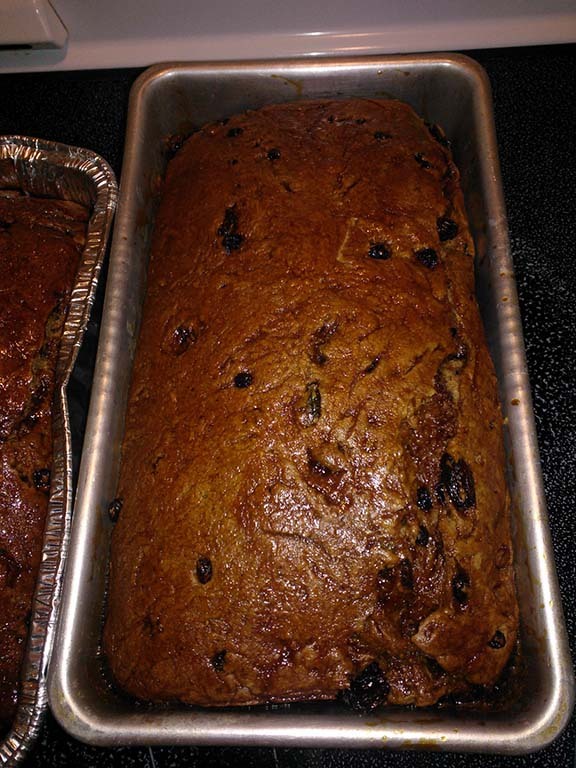 Pour batter into a greased loaf pan, 12”x4”x3”, lined with parchment paper. Bake in preheated oven for 30-45 minutes or until a skewer inserted comes out clean. 10. Glaze and leave to cool before slicing. 1. Combine 2 tablespoons honey with melted butter and bring to a boil. 2. Remove from flame and use a pastry brush to apply over the surface of the bun.